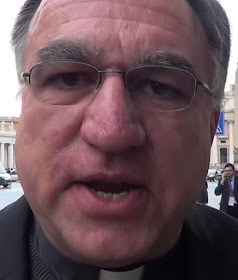 Vox Cantoris: Rosica blames his "interns" for his plagiarism - well, here is something written by him! Rosica blames his "interns" for his plagiarism - well, here is something written by him! Congratulations to Dorothy Cummings McLean and all at LifeSiteNews who were able to humble this man enough. Yet, not enough. He blames his interns for his theft, his plagiarism. He apologises to the University of St. Michael and then states that the apology is that the matter become known. Well, we'll see what the universities and his "teaching" Congregation do now. Rosica frequently used it without accreditation. Here is something that he did not plagiarise. For all your chant and rant, you obviously have very poor judgment in those you prop up as your gods... and those with whom you enjoy being photographed! Read this story below which has broken in the news today as Mr. Voris is exposed for what he is... and isn't. I beg the Holy Spirit to open your eyes, heart and mind to the Truth, not the myth you are pushing as the real Church, the "real" Catholic TV, the real nonsense. God bless you... from Madrid. How strange that this man should write me this from Madrid during that World Youth Daycare. Imagine, over there with Pope Benedict XVI and he thinks of me. I must be pretty special. My Tom, how far you've fallen. What a "sad, sad man" who is "neither a bishop, nor a liturgist." Those were, your words to me. Brought down by his own hand. This close-up picture looks like a Rosica flowerhorn cichlid. Politicians have their Interns write for them and the smart one's read the script before they present it to the public. What does that say about this alleged Catholic luminary? It says that he is very important. But what is the nature of this importance? In 1989/90 as a fresh university graduate in literature, a press secretary assistant to the world-famous Nobel Peace Prize winner, leader of Solidarity Trade Union and future president of Poland Lech Walesa (also, as it turns out, collaborator with secret services before, during and after the transition from communism to alleged democracy and freedom), I authored many public statements and letters which were signed with Walesa's name. The press secretary - sometimes but not often - made a single correction to statements I prepared and typed (using a type writer!). Of course, while I projected patriotism and heroism in my work, as required at that time (now, if I wanted to work for the national treasure-hero, they would have to be replaced by globalism and pragmatism), Rosacea's interns project progressivism and treason. When I learned what the alleged overthrow of communism was all about, I lost all hope and emigrated to Canada. I felt incredibly lucky at first, but... free Western societies are not at all what what we were made to believe. These people are puppets, running to and fro, doing photo ops and expensive dinners, as their assistants formulate their original thoughts (or plagiarize). The forces behind all of this are not Berogoglio, and not Walesa, they are the Vatican's homo-mafia and The City of London or Club of Rome. We are their human resources, their cattle, their useful idiots. But God sees them idiots and their moronic plot. Dorota, I think we can safely assume then that Rosica definitely has communist KGB connections and perhaps as , CMtv points out about McCarrick, may even be a card carrying member. In fact, if anyone goes over to CMtv for the Third Day of the perv summit you will read and or watch the reports of rooms and phones being bugged, clerics being surveilled and fearful to wear their cassocks because they may be reported as too traditional, sexual advances being made on priests by Bishops and Swiss Guards fending these perverts off also.